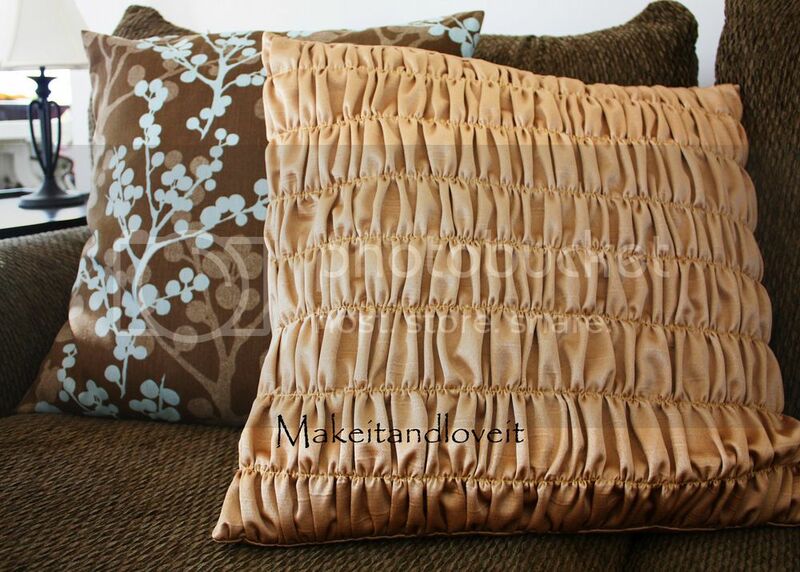 You know I’ve made pillow slipcovers before…..here. But this time I wanted some real texture on my pillow. I have seen this gathered technique on pillows at the store…..and gave it a try at home. Mine were 21 x 21 inches from side seam to side seam. And I would need a half inch on all sides for a seam allowance. So if I was going to make a plain front to my pillow, I would just cut out a piece that was 22 x 22 inches. But to have enough fabric to make the gather, just double the width dimension. So I cut out a piece that was 22 x 44. Then use a piece from your scrap pile that is 22 x 22 inches. (Never get rid of your scraps…..you’ll always find a use for them!!) The fabric can match if you’d like but no one will ever see it. Sew it right to that back piece of fabric, right along that gathered seam. Then start at your next seam down, and do the same thing. And make sure that your back fabric is laying flat each time you sew a new seam. You want it to keep its original 22 x22 inch size. Once you’re done with the whole piece, attach it to your back pieces (shown here) to make a slip cover for your pillow. « New SPONSOR, and a GIVEAWAY of their own. :Sigh: I think I'm in love…. Hi! I LOVE your blog by the way. And, I have a question :o) What type of fabric did you use for your pillows, and do you need to have a special needle to sew it? My fiance just moved into a new apartment and I will be joining him after our wedding, so my whole life has been obsessing over home decor items that I can make to help "feminize" what he has turned into quite the spartan Bachelor Pad :) These pillows will be a beautiful addition to our master bedroom. Thanks for the wonderful tutorial!! Love it! I am addicted to redoing my pillows, this may be the next thing I do! That is a great tutorial. The pillows look great. Oh, good question about the material. I will go add that to the tutorial….right near the top of the instructions. Thanks Teandra! Wow you are so talented! They are beautiful! love them! I'll have to try this. I love this, what a great idea! I just decided a few days ago I need some new pillows! I might do this! How do you do it!!?? Such cute ideas! Ashley, this must be my favorite pillow tutorial so far. Thank you for sharing. My husband may raise an eyebrow or two (even though he may not dare say anything) if I put some of these in my already girly living room. That is gorgeous!!! I need to make one (or two). Thank you for the tutorial. Lovely! And it made me think that it would be a nice technique for a smocked-look dress for a little one as well, with the backing fabric becoming a lining. Inspiring! Thank you! LOVE it! :) You are very talented. I just wanted to tell you that I LOOOOOVE your blog and I want to do every project I've seen lol. I just got a sewing machine for Christmas so I'm really excited to get started!!! This is FAB!!! I love it!! Thank you so much for the tutorial!! This is really beautiful. I'm excited to make my own. Thank you for your blog and all your free tutorials! I made the dolly diapers (with a matching changing pad) this year for all my little nieces. They were a definite hit. what a beautiful pillow! the gathers are lovely! How beautiful! Love all those "rows" of ruffles. Such a fabulous idea! I love it! Need to try it sometime! Gorgeous pillow, and wonderful tutorial! I will be using these in my daughter's new room, once we finish building and get around to decorating. Thanks! LOVE IT!! I can't wait to try this out! I love the texture of this pillow. Great! That is beautiful! I can't wait to try! Cute! My fiance says he likes throw pillows "that feel cool"–one with beading, sequins, fuzziness… I think he would like this one as much as I do! Wow. That's really pretty! I. Love. It. putting the scrap fabric behind to keep it square is a great idea. I'm going to try this sometime, for sure. That's gorgeous! You're so creative! This is awesome! I'm needing some new pillows, too and may give this a try. Thanks so much for the great tut! Oh I love it. So elegant and doesn't look so hard to do. Thanks for the post. Lovin' those gathers….I am definitely going to be trying this one…thanks for the tutorial! wow! that is amazing! thank you!!!! I love love love this pillow–although I have to say that I was a little sad you thought of Michael Miller mirror ball fabric as scrap! It's my fave fabric ever! I LOVE it. Now I just need to come up with something that "needs" pillows. you are brilliant with the sewing machine. the pillow looks great! I'm glad you're all liking this one. It really is a funky texture to have with you on any couch, bed or chair. Go for it! Yay! I've been wanting to make some slipcovers for my new Euro pillows on my bed and I wasn't quite sure how I would go about doing this… Love it! Thanks so much for all your wonderful ideas. I love your blog! this is soooo beautiful, can't wait to make one. It's so nice to make a plain fabric look so great! I adore that! I will definitely have to add it to my to-do list. Way Cute!! Thanks for showing us how to do it! Awesome pillows! What FUN! I LOVE the texture! This is so pretty! I would love to try this for pillow in my guest bedroom…once I pick out bedding! Love the pillows!! Our couch looks exactly like the one in the photograph! I've been looking for a way to spruce them up – Hooray! Problem solved! This is exactly what I needed! I'm still plugging away at the curtains, but bought the fabric for pillows at the same time. I've been stressing over making them and coming up with a unique pillow that ties the regular ones all together and this is it! Thanks! Hopefully I'll be posting a successful version of your pillows on my blog soon. i was going to make some curtains like this..and i was wondering how i could get them right…and i think with you inspiration they might just come out looking good…thank you. You Rock!!! Love the piloow and ur tutorial. Wow…that looks amazing. This pillow would cost big bucks at a store. Can I ask where you got the fabric (or whole pillow if you didn't make it!) for the pillow behind it? The brown and blue. I LOVE it! Once I have more time I plan on doing this pillow tutorial too! OH MY GOSH!!! Can I just say you are freakin amazing! I can't wait to make some cute pillows for my house! These pillows will be a beautiful addition to our master bedroom. Thanks for the wonderful tutorial!! Ashley, you keep amazing me with your talent for figuring out how to do things I wouldn't even attempt otherwise! I'm learning so much from your blog, and happily filing it away for future use! oooh that's gorgeous! And it looks so easy!! I have already made one for my daughter's room and now I am addicted–thanks for the fun idea!! So cute, yet simple! WEhat a great idea. I made this pillow! WOW, it a tough one… mainly because I used the completely wrong fabric (a shimmery, shiny, slippery type). But it was just too cute to pass up, so I put the time in and made it despite the difficult fabric. I linked to your blog on my post about it. Thanks again Ashley! Just beautiful! Now my West Elm-inspired throw pillows seem so blah…. this is absolutely beautiful! i think i will try to make this this weekend. i'm in desperate need of some new fresh pillows for our somewhat newly decorated bedroom. :) thanks! I'm going to make these NOW! Great tutorial and inspirational blog. 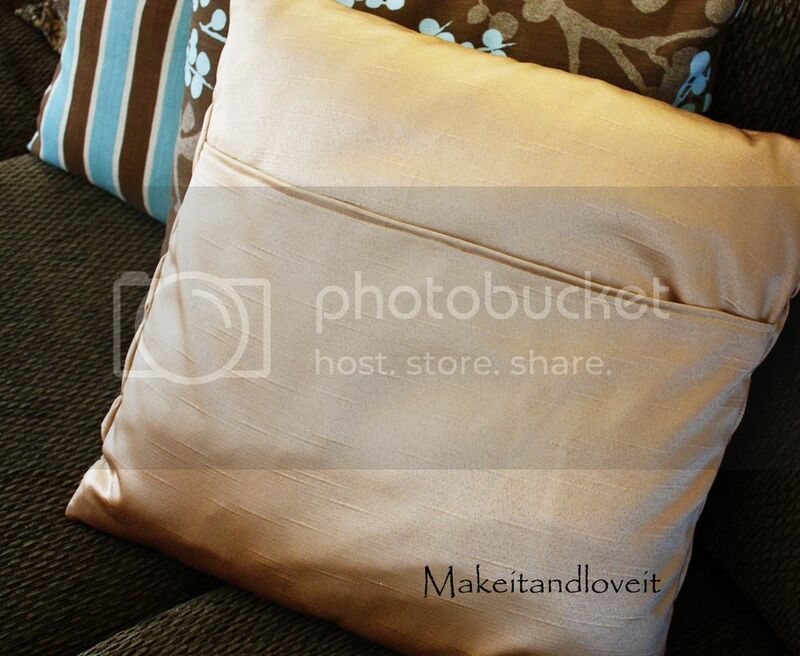 love your blog…quick question on the pillow tutorial. I left the gathering threads in and sewed each line down…but i didn' care for the two lines of thread showing-felt it looked kind of of sloppy (probably because they didn't run exactly together all the way across). I pulled all the gathering threads out after sewing all the lines down,,,,did you? Thanks for all the tutorials..super fun to read! Thank you so much for this tute! I made one a few weeks ago, and I love it! Love it! I'm in the process of making slipcovers for my living room throw pillows and I'm so excited to make one with great texture like that! Thanks for the great tutorial! So cute!! Thank you so much for sharing the tutorial..
whew, it's good to hear that others struggled as much as I did with this one. i think my first mistake was getting such silky fabric. I think I'm going to go back and get the same color, but in cotton fabric, then my stitches wont be all over the place! I love this pillow though so I'm going to give it another shot! Thanks for your awesome blog and keep posting! I'm amazed at how creative/talented you are! This will definitely be the next pillow I do! So gorgeous!! WOW! This is a great looking pillow! Thank you for sharing your tut with us….very easy to understand.